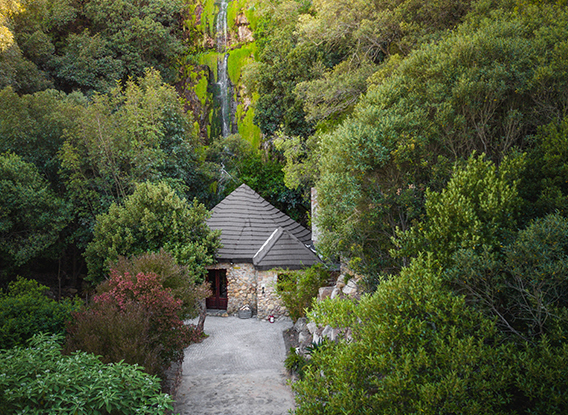 Nestled in the mountains against the backdrop of a magnificent waterfall, this 2-bedroom lodge is a truly romantic hideaway, complete with a private rock pool surrounded by unspoilt nature. Ideal for families, with one en-suite main bedroom and 2 single beds situated in the loft, you will enjoy the rustic charm, fully-equipped kitchen, outside braai facilities and the breathtaking views over the Franschhoek Valley. Kingsized bed in main bedroom. Two twin beds in 2nd Loft bedroom. Reservations are gladly accepted and require a minimum of a 2 night stay as well as a non-refundable deposit of 50% of the total value. Visa / Master credit cards details may also be provided in order to guarantee your booking. Deposits are refundable if booking is cancelled 30 days prior to arrival.